The phrase "life support" refers to the medications and equipment used to keep people alive in medical situations. These people have one or more failing organs or organ systems, and would not be able to survive without assistance. The organs and organ systems that often fail and require life support are breathing (respiratory system); heart and blood pressure (cardiovascular system); kidney (renal system); and intestines (gastrointestinal system). The brain and spinal cord (central nervous system) may also fail, but in this case life support is directed at keeping the other body systems functioning so that the nervous system has time to return to a state where it can again support the other body functions. The most common types of life support are for the respiratory, cardiovascular, renal, and gastrointestinal systems. Oxygen is the basic method for improving the function of lungs. When the lungs do not function properly because they cannot transmit the oxygen across the lung to the blood, or internal temporary (asthma) or permanent (emphysema) changes make the lungs work inefficiently, adding oxygen may often overcome the defect. The problem usually resides in the lungs, but is sometimes in the blood's oxygen carrying capacity, such as in some poisonings. In the case of severe illnesses or injuries, oxygen alone may not be sufficient. Often the mechanical problem is so severe that, to keep the person alive, a machine must assume the work of breathing. While patients in these situations may temporarily be sustained when a health care professional forces air into their lungs using a bag-valve mask, they will nearly always need a tube placed into their trachea (endotracheal tube) before they are placed on a ventilator. The clear polyvinyl endotracheal tubes can be placed through the mouth in most cases or the nose. Shorter tracheostomy tubes serve the same purpose and are placed surgically, through incisions in the front of the neck. Both can be initially connected to bags that are squeezed to help the patient breath. Patients are then placed on ventilators. Ventilators are machines that push oxygenated, humidified, and warmed air into the lungs. These sophisticated machines monitor, among other things, the amount of oxygenated air flowing into the patient with each breath, the pressure needed to deliver that amount of air, and the resistance in the patient's lungs. Patients nearly always need medications to help them tolerate being on a ventilator. These include drugs that induce reversible paralysis, sedatives, and, when necessary, analgesics. Special ventilators are sometimes used for children, and premature neonates now receive surfactant, which are medications that reduce alveolar surface tension, to help their lungs remain open while they develop. Adults with life-threatening spasms in their airways receive medications to reverse or prevent them. When a lung collapses, or when blood or fluid fills a patient's chest outside the lung (pleural space) so that breathing becomes difficult, clinicians place a tube (chest or thoracostomy tube) through the chest wall to drain the fluid or air and to re-expand the lung. The most common method to support patients with life-threatening abnormalities of the heart or blood vessels (cardiovascular system) is with medications. These include the vasopressorsused to raise the blood pressure and antiarrhythmics used to slow, increase, or normalize the heart's rhythm. Other medications used to stabilize the cardiovascular system in life-threatening situations include antihypertensives, used to lower severely high blood pressure when organs are suffering severe damage, such as during a stroke or heart attack, and diuretics to drain excess fluid from the body so that the heart has less work to do. The heart can be mechanically assisted to function normally. Patients with life-threatening heart rhythms can be cardioverted (shocked with electricity) back into a normal rhythm. Sometimes a temporary cardiac pacemaker must be placed when the heart's electrical system fails. Patients may also be placed on either a partial or complete mechanical system to support the heart. One of several partial systems, the Left Ventricular Assist Device, is passed through a groin artery to temporarily assume some of the heart's work until it can regain its ability to function independently. Patients sometimes go on a heart-lung bypass machine (aside from surgery) in order to maintain their heart while they are treated. Some centers also use artificial hearts, usually to maintain patients until they can receive a permanent heart transplant. If sufficient fluid collects around the heart, it can decrease the heart's ability to function. In those cases, clinicians must perform pericardiocentesis, drawing fluid off so the heart again functions. If the heart stops, clinicians perform cardiopulmonary massage or open-chest cardiac massage in an attempt to restore an effective cardiac rhythm. The renal system (kidneys, ureters, and bladder) can fail acutely, causing a threat to life. Many of these patients can only be kept alive through using an artificial kidney system, known as dialysis. In some cases, this may only be used for a short time; for many patients, they spend the rest of their lives—or until they receive a kidney transplant— on this artificial blood-cleansing system. Patients can use either peritoneal dialysis or hemodialysis. Peritoneal dialysis involves instilling into and withdrawing from the abdomen liters of special dialysate (water with a careful mixture of chemicals) each day. Hemodialysis, usually performed three times a week at special centers, uses a shunt, usually in an extremity, to connect the patient to a hemodialysis machine. Many patients on life support cannot take in enough calories to sustain themselves, even if they can eat. They receive artificial nutrition and hydration, essentially medically instilled supplements, to keep them alive. These may be given through nasogastric tubes for a limited period of time. Many receive this therapy through central lines (long catheters passing into the larger veins), gastrostomyn tubes, or similar surgically placed devices. Life support may also include blood and blood product transfusions and many types of drugs. Many patients receive insulin, sometimes as insulin drips, if they are in diabetic crisis. Other patients, especially those with cancers affecting their spinal cord or bone marrow, may receive emergency anticancer drugs or radiation therapy. An intensive-care patient is aided by several of the many life support systems available. called Lou Gehrig's Disease) or kidney failure, support for a failing organ may become chronic. 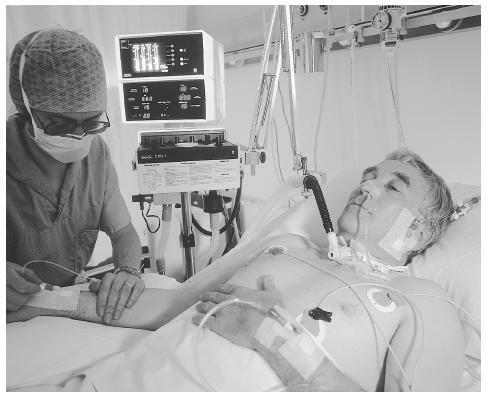 In the former case, patients may elect to be placed on ventilators to support their breathing, while in the latter they usually receive dialysis. Life support is often used inappropriately to maintain patients beyond the point at which it is clear that they have no chance of recovery, sometimes called "futile treatment." Such patients often have failure in multiple organ systems and one or more severe underlying diseases. Futile and medically inappropriate interventions may violate both the ethical and medical precepts generally accepted by patients, families, and physicians. Most of those who receive such futile treatment are elderly, although futile treatment seems to be more common among the much smaller number of young people dying in hospitals. As shown by Rivera and colleagues, families are responsible for continuing futile treatment in the majority of cases, although it is sometimes accompanied by family dissent over the right course of action. Physicians continue futile treatment in only about one-third of such cases, sometimes because of liability fears. Unreasonable expectations for improvement were the most common underlying factor. Bioethics consultations can often resolve issues of unwanted or non-beneficial medical treatments. To be on life support the patient must still be alive. However, these systems may be used to maintain the body of an individual who has been declared dead by brain criteria (brain dead) until critical organs, such as the heart, lungs, liver, kidneys, and pancreas, can be recovered in the operating room. Occasionally these systems are also continued for such a patient until families arrive or until they have come to terms with the death. In these cases, however, they are simply called support rather than life support. When patients are recovering and as long as they or their surrogate decision makers want medical treatments, continuing life support is appropriate. When it becomes unclear whether the treatment will be of benefit, it is often appropriate for the family (or patient) and the clinician to use a time-limited trial of therapy. This is a decision to use life support for a specific period of time; if there is no improvement at that point, everyone agrees that the support will be stopped. Iserson, Kenneth V. Death to Dust: What Happens to Dead Bodies? 2nd edition. Tucson, AZ: Galen Press, 2001. Iserson, Kenneth V. Grave Words: Notifying Survivors about Sudden, Unexpected Deaths. Tucson, AZ: Galen Press, 1999. Rivera, Seth, Dong Kim, Shelley Garone, Leon Morgenstern, and Zab Mohsenifar. "Motivating Factors in Futile Clinical Interventions." Chest 119 (2001):1944–1947. Hey i was wondering how long can a person survive on last support? like how long do families usually wait until they could turn it off? Doctors explained they were waiting for family to arrive to remove life support. Life support was removed slowly- we waited 35 minutes for my brother's last gasp. Absolutely traumatic experience to go through this, in no way was any tiny bit helpful in coming to terms with his death- rather agony -desperate relief when he finally stopped having seizures and life support removed. Experiencing his skin changing color after his last gasp was most traumatic. Please comment on how this could possibly help family come to terms with his death. Nature taking it's course would have sufficed- this was absolute torture for us. Time of death 6 a.m.- rushed to ICU for life support- life support removed at 3 p.m.- last gasp at 3:45 p.m.
what if there are no other family members to make the decision whether to turn life support off? what if they are in the same situation? While on advanced life support can the heart stop on it's own or does the machine need to be turned off for this to happen? my dad is on life support-hes been in and out of the hospital and rehab for his health for 6 months and now hes back in the hospital and is on life support! When i found out he was on life support i was terrified. would he be able to survive? How long does it take for him to stay on life suppport? Can he recover? Do you have any answers? My first cousin 16 years old this saturday, second heart transplant, was taken off life support 12:22 pm today, almost 1 hour ago. waiting. My husband has been on respirator for 10 days they have not tried to reduce the restorations that the machine does for him. Why? He is now a wake they at first gave him morph. for pain but he is a copd patient . so this is contraindicated . so that was stopped. He is getting up to 35 resp. at each trial but his heart rate goes up to 140 and they stop the test. at first he was at 140 ht. and resp. at 35 in 2 minutes now he is up to 4 minutes at the same vital signs can he eventually come off this machine and they have not been giving him any broncho dilators before the test and sometimes they don't suction him before the test. and he also has Congestive Heart Failure.that has been treat over the years. with medicine and is diabetic. Does he have to go to a trachea respirator? My brother 71yrs of age (a twin) was pulled off of support because the rest of the family thought it best. My brother was found on the floor of his assisted living apt., taken to the hospital, was responsive at first but it wasn't long before he wasn't. He had what the doctors called a semi-coma. He had swollen feet,hands,and face: fluid retention. His kidneys had shut down and his liver. Although his brain was not dead. The doctors said that he was and the ventilator was keeping him breathing. They pumped him full of morphine and then took the ventilator away. My brother gasped twice and that was it. Do you think, if he had stayed on the ventilator, would he had come out of the coma eventually? Some, say he would have to have dialysis or a kidney, new liver, and I guess I just answered my own queston. It was best to let him go. My father has diabetes, he was doing dialysis for his kidney but now suddenly he had lung infection and is on life support. It is really hard for my mother and me, is there any chance that he will get better? ?